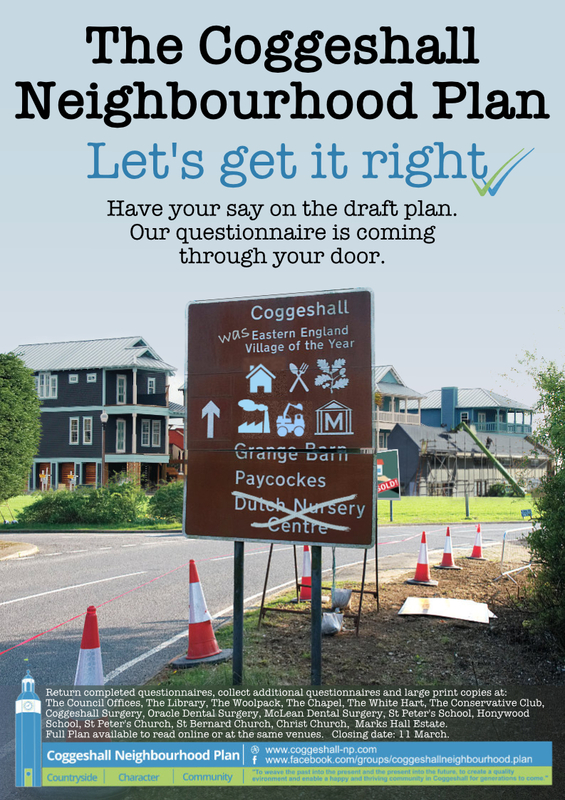 In 2015, Coggeshall Parish Council began the process of making a neighbourhood plan for Coggeshall. Drawing up a neighbourhood plan lets people shape the future of their neighbourhood by having a say in the planning rules that affect development within the Parish. We asked questions, held meetings, staged events to find out what kind of Coggeshall people hoped for and then drew up policies about development in the Parish that would make these hopes into reality. The policies have to support Braintree’s District Plan, they have to follow the approach in the Government’s National Planning Policy Framework and they have to have the support of the community and various statutory bodies. You can use the page references in the questionnaire to find the full text of the policies in the Plan. Why is the Coggeshall Neighbourhood Plan Allocating sites for development? The short answer is: We do not have a choice and it is the most sensible way forward to protect the parish and promote positive development. The sites either have planning permission or are allocated in Braintree District Councils Local Plan. Therefore, they will be developed whether or not they are included in the Coggeshall Neighbourhood plan. The houses built on these sites will ‘count’ as Coggeshall’s contribution to the Government requirement to build new homes. If they are not included, then the development of these sites will not be taken into consideration if or when new applications for speculative housing development are submitted for planning permission. We will have greater opportunity to influence the design of the development to try and make it blend with the village using our design principles. It will help the Community and the Parish Council to influence the use of the Section 106 money from the developments to try and ensure it is allocated to infrastructure in the village. For greater detail on these sites please read the allocated site policies in Volume one of the Neighbourhood Plan. Your answers will be used to draw up the final version of the Plan. The people of Coggeshall will then have the opportunity to vote in a referendum. If a majority of those who vote say “yes” then the Plan will be “made” and become a part of the planning rules that govern development. © Copyright - Coggeshall Neighbourhood Plan 2016 - Designed by Ross-IT.